What does a man named Philip Dormer Stanhope born over 350 years ago in Great Britain have to do with a lovely place to live in Michigan? Lord Stanhope, also known as the 4th Earl of Chesterfield, is the namesake of Chesterfield Township in Macomb County, Michigan. Were he alive today, the Earl would no doubt appreciate Chesterfield Township. With its entire eastern edge bordering the picturesque Anchor Bay, he’d see boats hither and thither during the warm months, he’d enjoy excellent sunrises year-round, and he could have tea with friends at one of the hundreds of homes. Though you’re likely not an English lord, you can also enjoy all that Chesterfield Township has to offer. Having become a charter township as recently as 1989, many of the area’s homes have a “new” feel about them. Built in the last three decades, they are larger than those in the suburbs closer to Detroit, typically featuring at least three bedrooms and at least two bathrooms and exceeding 1,900 square feet. With five miles of waterfront properties, a few extra dollars will get you a view just as striking as any waterfront view you’ll find Up North. Would you like a 4 bed/5 bath 5,500 square-foot home with floor-to-ceiling windows, spiral staircases, and a jacuzzi tub in the master bathroom? While you won’t find thousands of them in Chesterfield Township, there’s at least one that could be yours. When you choose to live in Chesterfield Township, you’ll find all of the conveniences of modern life minutes away or, if you’re headed to downtown Detroit, a quick trip down I-94. Selfridge Air Force Base is just south of the the township, providing numerous employment opportunities, and, of course, free air shows. The shopping plazas mix well with the subdivisions, and three large parks feature playscapes and baseball fields. Brandenburg Park, on the shoreline of Anchor Bay, is a 17-acre park offering basketball, tennis, and volleyball courts, as well as picnic areas, boat launches, a splash pad, and a 500-foot pier extending into Lake St. Clair. If you’re raising children in Chesterfield Township and will use the local school system, you’ll utilize one of three systems: Anchor Bay, L’Anse Creuse, or New Haven. Each district can claim a variety of honors; Anchor Bay, for example, recently became one of only 433 districts in the US and Canada (23 in Michigan) to be placed on the AP District Honor Roll. L’Anse Creuse High School North is a National Blue Ribbon School. 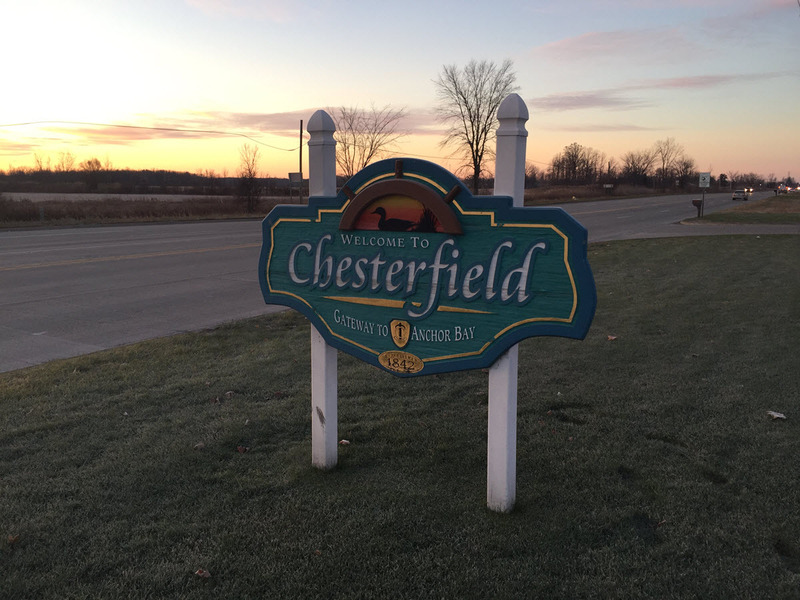 While he won’t be personally able to greet you once you move here, somewhere, Lord Chesterfield will no doubt be smiling and appreciative of your choice to call your home the township that bears his name!